Arista promises solar/wind integrated “Power on Demand” via GE’s nickel-salt Durathon batteries. General Electric’s Durathon batteries may be the fruit of a $100 million research effort out of GE’s transportation division. 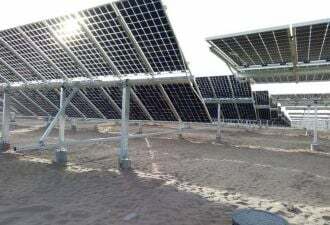 But it looks like the device's first big applications are going to be in integrating solar and wind power into the grid, via new partner Arista Power. GE and Arista said Tuesday that they're teaming up on development and sales of Arista’s Power on Demand System, using GE’s Durathon nickel-salt batteries. The idea is to back up renewable power such as solar and wind, to smooth output or even sell power back to the grid during peak periods, according to Tuesday’s announcement. Solar power is rarely backed up with batteries today -- it’s just not worth the extra costs involved. And while wind power energy storage adds up to more than 200 megawatts deployed around the world today, it’s too expensive for most applications. Mainly, it’s being installed because it’s cheaper than even more costly options, like adding new power lines or transformers, or rewriting PPA agreements with bigger risk premiums because the wind farm’s power isn’t reliable. 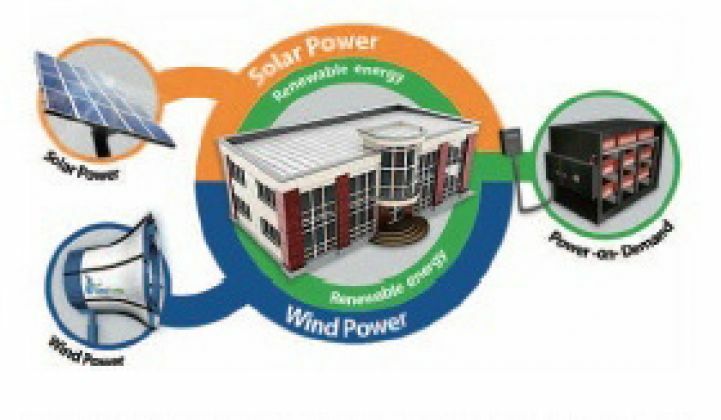 Rochester, N.Y.-based Arista says its patent-pending system can solve these problems by balancing wind turbines, solar PV, the electric grid, and other power sources with a custom-designed battery storage system and “proprietary real-time demand monitoring technology.” GE and Arista didn’t announce any projects or provide any cost figures. All in all, it sounds a bit like the virtual power plant technology being developed by giants like Siemens and startups like Viridity Energy, which combines software and systems that link buildings and facilities to the overall ebb and flow of grid power. The end goal is to cut power bills and improve grid efficiency, and while batteries don't necessarily need to be involved, they really help -- particularly when a building or campus is trying to maximize the value of its locally generated renewable power, either by consuming it in real time or storing it for use or sale when power prices are higher. Arista provides an interesting new venue for GE’s Durathon batteries. The fruits of an R&D effort launched in 2009 and a new manufacturing plant in Schenectady, N.Y., the nickel-salt batteries are “50% smaller and 25% lighter than traditional batteries,” GE claims, though it doesn’t specify what technology it’s comparing them to. They’re also resistant to extreme temperatures, recyclable, come with a 20-year lifespan, and require no cooling and only minimal maintenance, GE says. The “no cooling” part is important, as it distinguishes GE’s nickel-salt chemistry from the super-hot sodium sulfur batteries that now form the backbone of the energy storage deployed on the grid today. Japan’s NGK is the premier maker of sodium sulfur batteries, with nearly 100 megawatts deployed, mainly in Japan but also in the United States. But batteries (and fuel cells) that run at blistering-hot temperatures are hard to maintain and secure. That may be OK for remote wind farms, but not so good for the UPS you want to install in your data center’s backyard. Reports of fires at NGK sites (and with batteries from other manufacturers) don’t help the matter. Filling the gap are a host of battery technologies, ranging from old-fashioned lead-acid to new lithium ion, nickel-zinc, advanced solid-state, flow battery and zinc-air chemistries. Fuel cells are another option: Bloom Energy has launched a dedicated data center “mission-critical” UPS business line, with Apple’s new North Carolina data center as a first customer, according to reports. That data center is also going to have 20 megawatts of solar power. As for nickel-salt (or nickel-sodium) batteries, GE’s main competitor would appear to be FZ Sonick, the Italian company formerly known as Fiamm, which bought a controlling interest in Switzerland's MES-DEA, the sole European manufacturer of sodium-nickel-chloride batteries, another name for the general chemistry involved. Nickel-salt was pioneered by Daimler for use in electric vehicles, where it has clocked decade of solid performance in a 3,000-vehicle fleet that's logged over 150 million kilometers. But the technology, nicknamed Zebra, failed to find customers, perhaps because of its novelty. GE’s big push right now is in stationary markets, though it’s also working on big batteries for train locomotives.